We’ve learned a lot in the last week: how long it takes for Emma to walk a mile (not long), how long it takes me to walk a mile (a lot longer); how to navigate forest service roads, how to use our JetBoil stove, how to tell the Oak Flat story in just a few words. 100 miles down, 1400 to go. The weather’s heating up, temps will hover around 100 degrees for the next few days. Mornings are still cool and breezy, so we’re switching to early morning walking. Our alarm-dog Waldo wakes us up early enough to get a good start before the heat sets in. We’ve passed the Muckleshoot Tribe and the Yakama Nation and next will cross the Confederated Tribes of the Umatilla territory. Walking along rivers, below cliffs, and through forests that were once only inhabited by these groups I imagine what it must have been like. No noise from cars, no pavement, no rush to sit in front of a computer or work in a factory or run a cash register all day. A culture built around life in nature seems like the best possible life anyone could have. While I’m walking I often think about the people at Oak Flat and what they must be doing right now. I imagine sitting in the cool shade and the clean water at Gaan Canyon. Knowing this special place will be there when we arrive is a blessing. Please visit http://bit.ly/1KQZduh and take a minute to complete one action to help save Oak Flat today. A little snake on the side of the road, anyone know what kind? 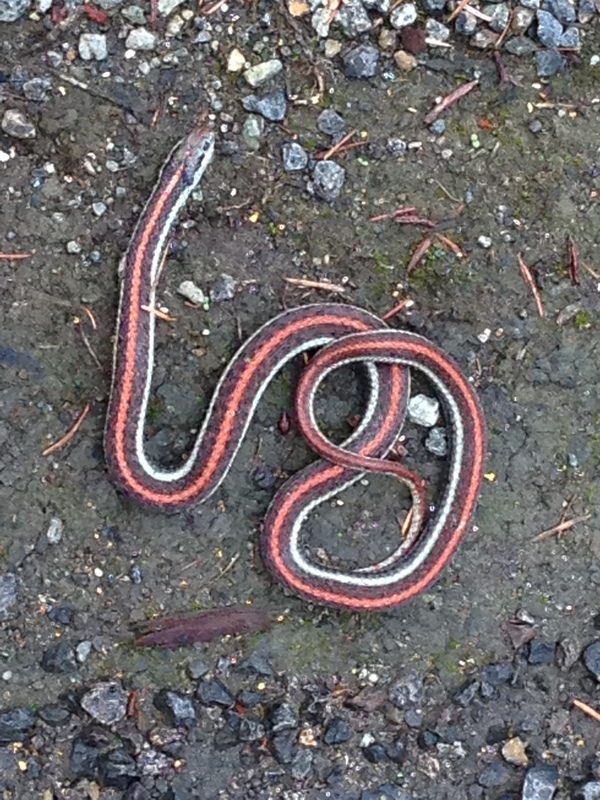 I think your snake is a Northwestern Garter Snake.